As a guitar-wielding musical virtuoso, Jimi Hendrix was a defining figure of 1960s culture, both as a representation of the staggering musical innovation of the period, and the experimental drug culture that would ultimately take his life. An inspiration to aspiring guitarists and musical performers up to the present day, Hendrix’s restless creativity and showmanship is the stuff of legend. Yet for all his global reach, his most famous band, The Jimi Hendrix Experience, was mostly British, and in early 1967, the act graced the stage in Hull, en route to US stardom. 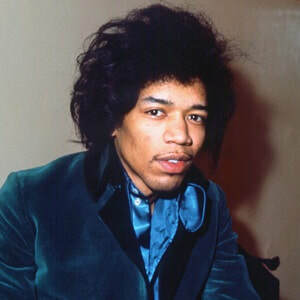 Jimi Hendrix was born on 27th November 1942 in Seattle, Washington, to Al Hendrix and Lucille Jeter. His parents were both African-American, with his paternal grandmother, Nora Moore, being one-quarter Cherokee. His parents had married in the March of his birth year, but Al was drafted to serve in World War Two and left three days after the wedding. Denied the customary military leave for childbirth, he wasn’t discharged from the army until September 1945, by which time Lucille had turned to alcohol, having struggled to bring up Jimi in the interim period. After a tough period of unemployment, alcohol abuse and domestic fights, Jimi’s parents divorced when he was 9, and his mother died from cirrhosis of the liver in 1958, aged just 32. Hendrix bought his first acoustic guitar at 15 years old in May 1958. Learning to play from blues artists and quickly forming his first band, his father bought him his first electric guitar a year later. Before he was 19, he’d been caught riding in stolen cars twice, and so enlisted in the US army in 1961 to avoid prison. Military life wasn’t an area that suited Hendrix well however, and he was quickly discharged once he’d completed his paratrooper training for poor conduct. On leaving the army, Hendrix moved to Tennessee in September 1963 and made a living for the next two years performing at a series of venues throughout the South. Hendrix was in and out of bands during this period. He joined the Isley Brothers’ back-up band in early 1964 but left the band in October of that year after growing bored of playing the same set every night. He joined Little Richard’s touring band, the Upsetters, but was fired after less than a year. He played with New York-based band Curtis Knight and the Squires for 8 months, but, frustrated with his role as a sideman, moved to New York City’s musically vibrant Greenwich Village in mid-1966. It was playing here that he was noticed and recommended to aspiring music manager Chas Chandler, who signed Hendrix and brought him to London. Chandler immediately began recruiting members for a band designed to highlight Hendrix’s talents - The Jimi Hendrix Experience. The Experience played their first show in October 1966, and came to wider UK exposure with a performance at the Bag O’Nails nightclub in London in mid-November. The Experience’s first single, “Hey Joe” was released a month later. It was in these early days of The Experience that Hendrix first tried LSD, a component part of the psychedelic culture that the band would be associated with. The Experience’s first album, Are You Experienced, reached no.2 in the UK chart on release in May 1967. Their record deal required them to turn in a second album by the end of the year, which they did with Axis: Bold as Love in December. By 1967, Hendrix was regularly using cannabis, LSD and amphetamines particularly whilst touring, and this created a freewheeling, chaotic environment that was fully encapsulated on their third and final album, Electric Ladyland, released in October 1968 – their most ambitious and critically-lauded effort. Hendrix was the world's highest-paid rock musician by mid-1969, and the band's Woodstock performance in August of that year was one of his most famous live performances. However, a little over a year later, on September 18th 1970, Hendrix’s girlfriend Monika Dannemann awoke to find him unconscious but breathing, and he was pronounced dead at St Mary Abbot's Hospital at 12.45pm, aged 27. His cause of death was ruled accidental, from barbiturate-related asphyxia (Dannemann claimed he took 18 times the recommended dosage of her sleeping tablets). He was buried in his hometown of Seattle, Washington. Jimi Hendrix packed an awful lot into a career that, at most lasted 7 years, and really only gained any kind of success in the last 4 years of his life. He changed popular perception as to what a Black musician was, and his performances crystallised his status as a legend in the eyes of music fans everywhere. And on his way, just for a night, he brought that magic to a ballroom in East Yorkshire. Header image of Jimi Hendrix in 1966 found on 'Jimi Hendrix' at Biography.com. 'Hendrix, Al (1919-2002), Father of Jimi' by Alyssa Burrows on HistoryLink.org. ​ 'Jimi Hendrix, Robert Palmer, The Mandrakes and Me' by Brian Cooke on his blog, You Never Told Us.